The elephants are ready, now onto the pigs! The day is grey, so even taking the picture using daylight did not help. 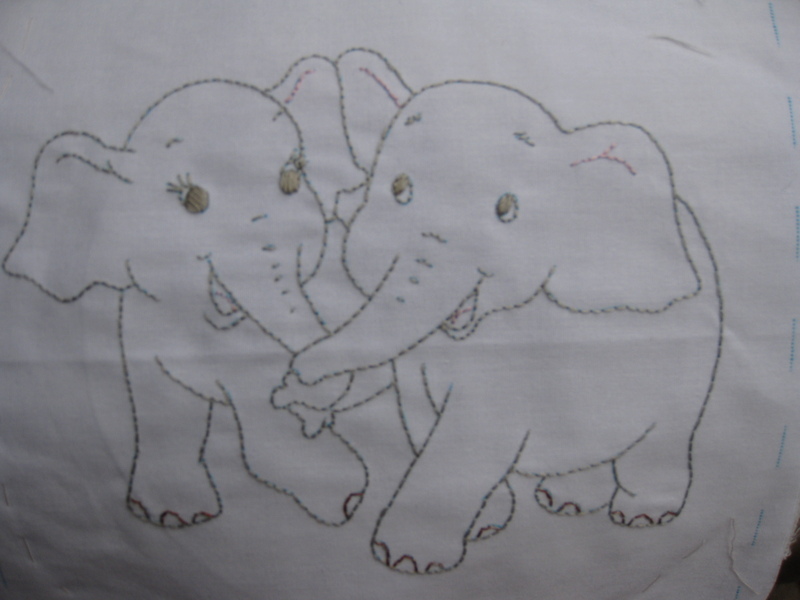 The embroidery is simple - I can get a block done in one evening, if undisturbed. The cat has learned to stay away from the floss (or I am the one who was trained to keep it away from her?). I have a few weeks to finish the baby quilt for my grandson, but other projects keep getting in the way: the wool embroidery wall hanging, Winter in Wonderland embroidery (this one is super long term...), the Hawaiian blocks, the round robin for the quilt guild... Ideally, I would be paid to do all this, in which case I could say this all means 'job security'. Right now, I am settling for 'sanity'! The elephants are adorable. I love doing embroidery, don't you? 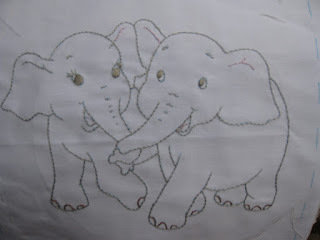 Lindos elefantes! Me deu vontade de borda-los também. Um abraço.